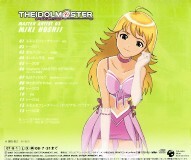 This is a song and talk CD featuring characters from The IDOLM@STER, Kikuchi Makoto (Hirata Hiromi) and Hoshii Miki (Hasegawa Akiko). The songs are by Hasegawa Akiko. Hiromi just participates in the talk.